The Palliser 41416 Flicks Home Theater Seat is a new contemporary design featuring Power head rest feature along with power recliner seats. With the stylish look and a host of other great features to make this chair the perfect way to complete your home theater setup. So sit back and enjoy the latest movie, sporting event, or new season of your favorite show with these wonderful seats from Palliser. Each one comes in a variety of fabrics and leathers, and can be customized to fit nearly any home décor. 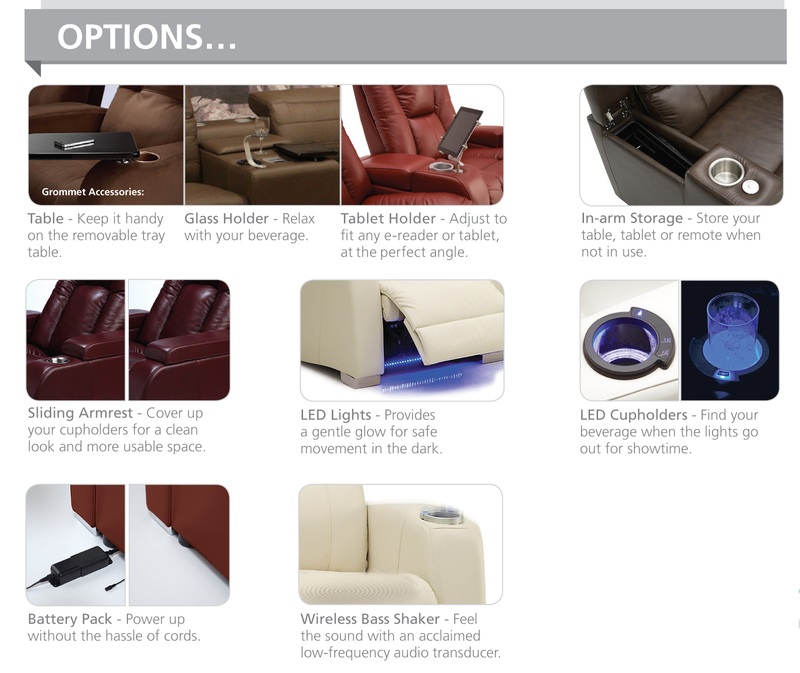 See HTS options (right) for additional features to customize your chair. Comes standard with LED and 7 button function cup holder. Features multi color LED cupholders and groundlighting. Choose from seven different colors, three light intensities, power recline and power headrest activation, a "home" button and two memory preset keys, all on one cupholder!